A large truck can transport a rocket component the size of one engine. But how do you transport a piece as tall as, say, the Leaning Tower of Pisa? NASA is preparing for the first of many flights of the agency’s Space Launch System rocket and Orion spacecraft. Every day we’re making progress toward their first integrated test flight. Today, that work is taking place at numerous sites around the country, but the work of that nationwide team is firmly focused on one place – the launch pad. Hundreds of companies across every state have been a part of SLS and the Orion crew spacecraft, many of them small businesses providing specialized components or services. That work comes together at NASA and prime contractor facilities where the “big pieces” are assembled before it all comes together on the launch pad at NASA’s Kennedy Space Center in Florida. A test article of the Interim Cryogenic Propulsion Stage was delivered to Marshall Space Flight Center from United Launch Alliance in June. Some of the pieces have a relatively direct route to the launch pad. At Marshall Space Flight Center in Huntsville, Alabama, where the SLS program is managed, for example, the flight unit for the Orion Stage Adapter (OSA) that will connect the SLS second stage to the crew spacecraft is being welded, and welding will begin next month on the Launch Vehicle Stage Adapter (LVSA) that will connect the core and second stages. When completed, the LVSA will travel by barge to the gigantic Vehicle Assembly Building (VAB) at Kennedy Space Center (KSC) in Florida, where final stacking of SLS and Orion will take place. The smaller OSA has the option of barge or truck, and after arriving in Florida, will make a stop at a facility where 13 CubeSats will be installed before continuing on to the VAB. Half an hour away, the second stage of the rocket, the Interim Cryogenic Propulsion Stage (ICPS), is being completed at the United Launch Alliance facility in Decatur, Alabama. 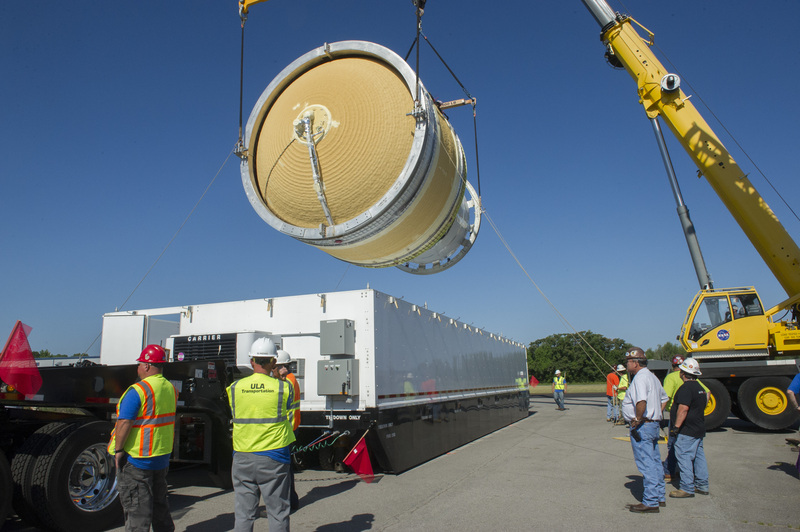 The process for the ICPS will be one step longer – after being barged from Decatur to Florida, the stage will be prepared for flight at a payload processing facility before being moved to the VAB for stacking. 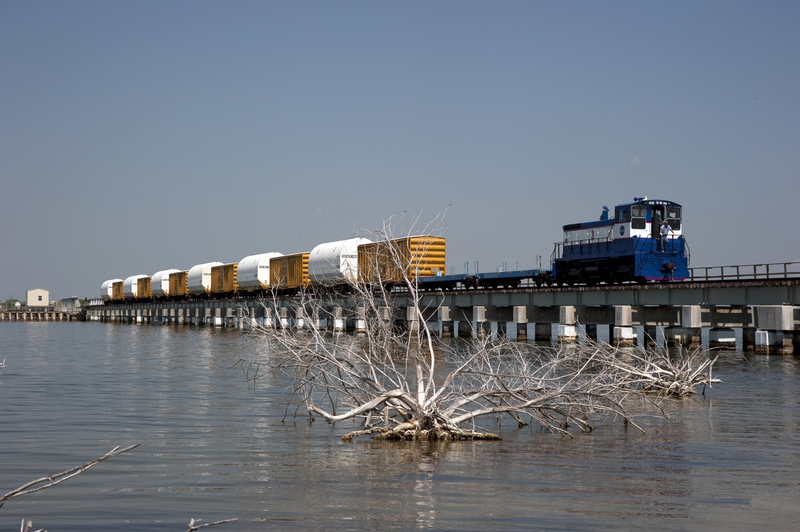 Booster segments being delivered by train to Kennedy Space Center during the space shuttle era. 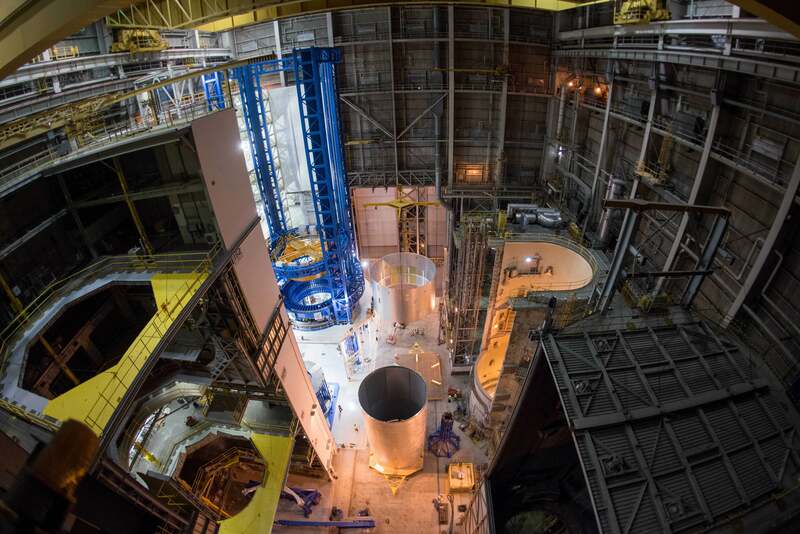 Propellant is already being cast into booster segments for the first flight of SLS. The boosters will be transported by train from an Orbital ATK facility in Utah to Florida. Since the 17-story-tall boosters are far too long to be transported in one piece, the boosters will be transported in segments. They’ll arrive at a processing facility at Kennedy before being moved to the VAB where they’ll be stacked vertically and joined by the rest of the rocket. 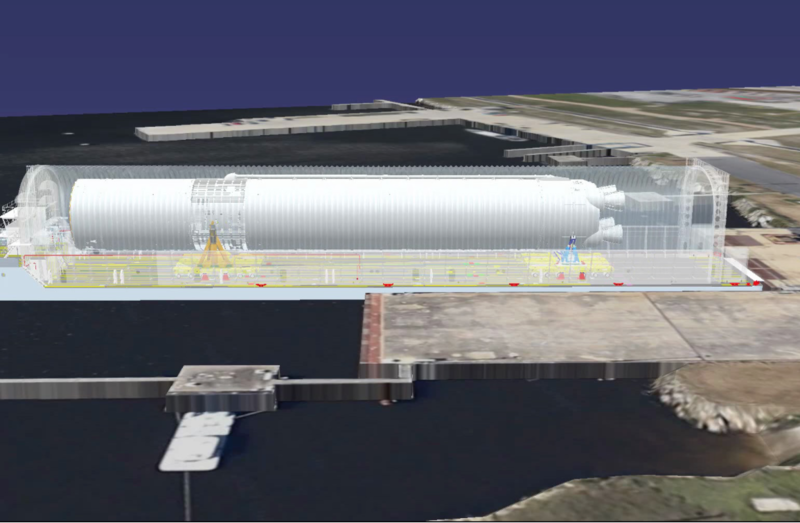 NASA’s large Pegasus barge will be able to transport the SLS core stage, which will be more than 200 feet long. This one’s a little more complicated. RS-25 core stage engines are currently in inventory at Stennis Space Center in Mississippi, where engine testing is taking place. The core stage hardware for the first launch of SLS is currently being welded at Michoud Assembly Facility in New Orleans. The engines for the first flight will be transported from Stennis to Michoud, and integrated into the first core stage when it’s completed. The core stage with engines will then be transported back to Stennis, where the 212-foot-tall stage-and-engine assembly will be placed into a test stand and all four engines will be fired together in the largest liquid-engine ground test since Apollo. After the test, plans call for the stage to be shipped to Kennedy by barge, where it will be brought to the VAB for assembly with the rest of the rocket. The crawler-transporter is capable of transporting 18 million pounds from the VAB to the launch complex. NASA is on track for the first mission to launch no later than November 2018 from Florida. The first test flight of SLS and Orion will be incredible, and it will pave the way for our second exploration mission – our first with crew aboard the spacecraft. As these missions continue to come together, we’re closer to sending astronauts to Red Planet than at other point in our history. All the work we’re doing together today will continue to enable that journey in the future. Join in the conversation: Visit our Facebook page to comment on the post about this blog. We’d love to hear your feedback! During the two-minute booster test, 537 instrumentation channels provided data to meet 82 different test objectives. They came for an awesome display of pure propulsive power. They got a lesson in the realities of spaceflight. …Followed by an awesome display of pure propulsive power. 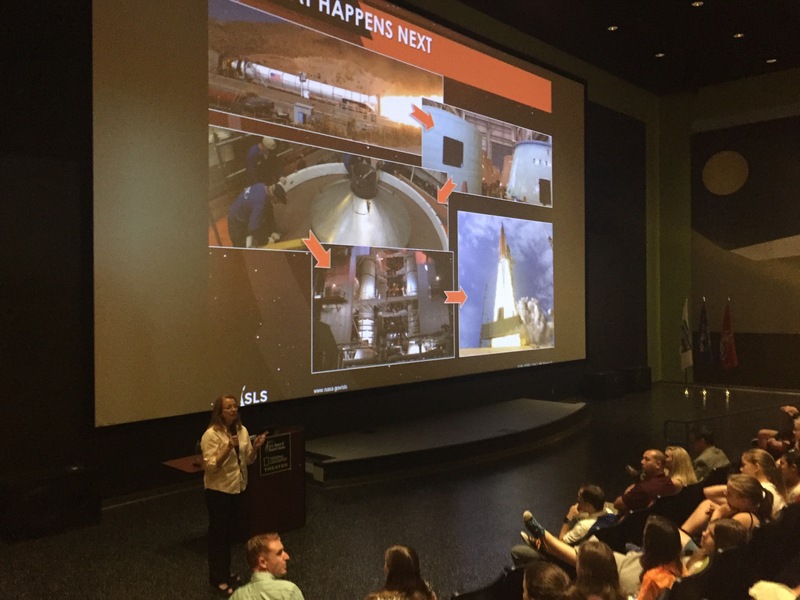 While engineers in Utah prepared for the second Qualification Motor (QM-2) test of a Space Launch System (SLS) solid rocket booster, another team of NASA engineers from Marshall Space Flight Center visited the U.S. Space & Rocket Center in Huntsville, Alabama to give a presentation to Space Camp trainees and museum guests explaining what would be happening during the test, how the boosters work, what the next steps are to get the boosters ready for the first launch, and how Space Launch System will play a key role in NASA’s Journey to Mars. The museum, which is home to Space Camp, is practically in the backyard of NASA’s Marshall Space Flight Center, where SLS is managed. 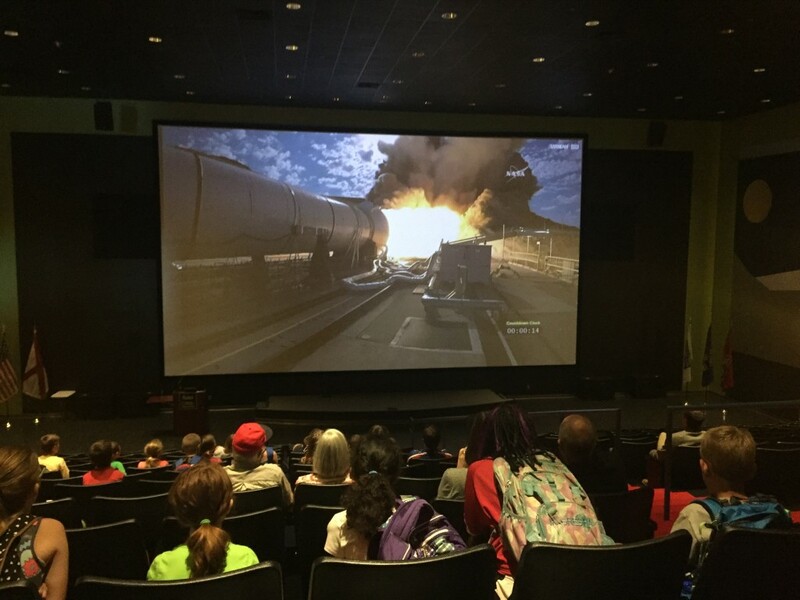 On the morning of the test, museum attendees and Space Camp trainees filled a theater at the museum to watch the two-minute-long firing of the 17-story solid rocket booster, the most powerful ever built for human spaceflight. The firing would provide information to answer 82 questions about how the booster performs, including how it would respond in cold-weather conditions. What they ended up seeing that day was a huge milestone for the Space Launch System and a major step toward human exploration of deep space. The motor performed as anticipated for the burn. The inside of the motor, where the propellant had been cooled to 40 degrees Fahrenheit to simulate a cold day at the launch site, reached nearly 6,000 degrees, and the flames leaving the booster melted sand into glass. The test clears the way for qualification of the solid rocket boosters as ready to fly on the first launch of SLS in 2018. While the test was delayed, attendees of the viewing heard a NASA engineer explain information about the test and boosters, and their path from QM-2 to the launch pad. In addition to the test and presentation, they also got a real-life lesson on the challenges in developing and flying space systems. As hundreds of children took their seats, the live NASA TV feed appeared on the giant theater screen, showing the booster mounted in the test stand – and the word “hold” underneath it. A technical issue had delayed the test – a problem with a sequencing computer. 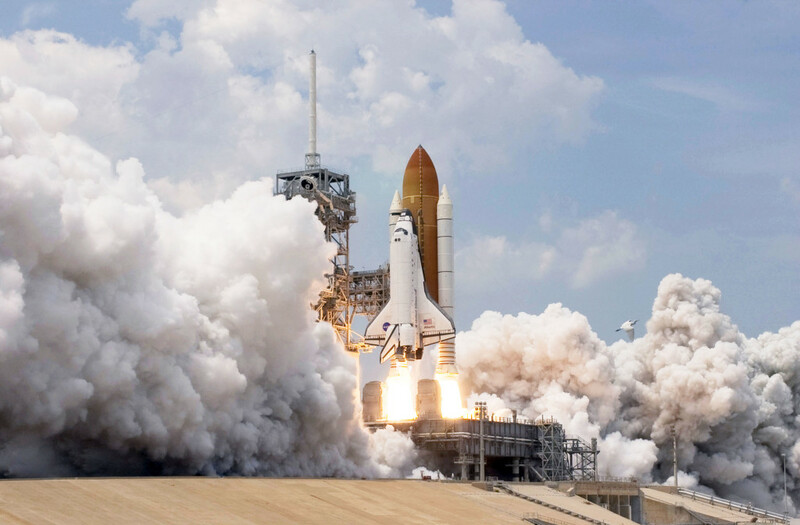 When one listens to the audio feed of a rocket or shuttle launch, you can hear announcements of the steps being taken as the countdown clock nears zero – “vehicle is on internal power,” “main engines start,” etc. For a rocket to launch, numerous things have to all happen properly, and all in the correct order, one event paving the way for the next. The booster test required that same sort of preparation and precision – many things had to happen properly, and in the proper order, both before and after ignition of the booster. When the computer responsible for managing that sequence failed to function correctly, the test had to be delayed. From a big picture view, the delay was relatively minor – after a discussion on how best to proceed, the software was changed out, the clock was reset, and the test took place just one hour after it was originally scheduled. During the delay, the audience heard the NASA team’s presentation and got a big-screen viewing of last year’s first qualification motor test (QM-1) test. But they also got a real-world demonstration of what they’d been learning in Space Camp – the best word you can hear in the space business is “nominal,” meaning everything is proceeding as expected, but there are sometimes you don’t hear that word. You work as hard as you can to make sure that you do, and you work as hard as you can to be prepared for when you don’t. 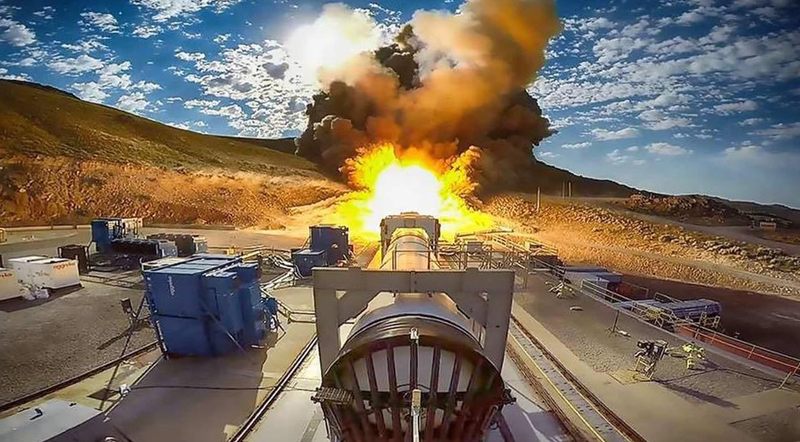 When an “off-nominal” challenge arose, the NASA and Orbital ATK team in Utah rapidly assessed the problem, identified options for moving forward, evaluated the risks and benefits, and implemented a solution that allowed the test to proceed quickly and successfully. Museum visitors and Space Camp trainees watching the QM-2 test at the U.S. Space & Rocket Center in Huntsville, Alabama. While some of the original attendees had to leave in favor of hands-on activities like microgravity water-tank training, when the test took place, the remaining audience counted down to the firing, and cheered when the booster ignited and extinguished, the giant screen showing the close-up shots at almost life size and the sound system doing its best to do justice to the roar of the motor as it turned desert sand into glass. There was excitement over the observation that the next time a booster like this is lit, it will be powering SLS off the launch pad for its first flight. The one QM-2 solid rocket motor, by itself, produced more thrust than it takes to lift most rockets off the ground and send them into space, and required millions of pounds of concrete in the test facility to make sure it didn’t move. Next time, there will be nothing holding it back. Work is progressing rapidly in preparation so this artists concept can become a reality. On Monday, the United States celebrated the Fourth of July. Fireworks and backyard grills were ignited across the country. 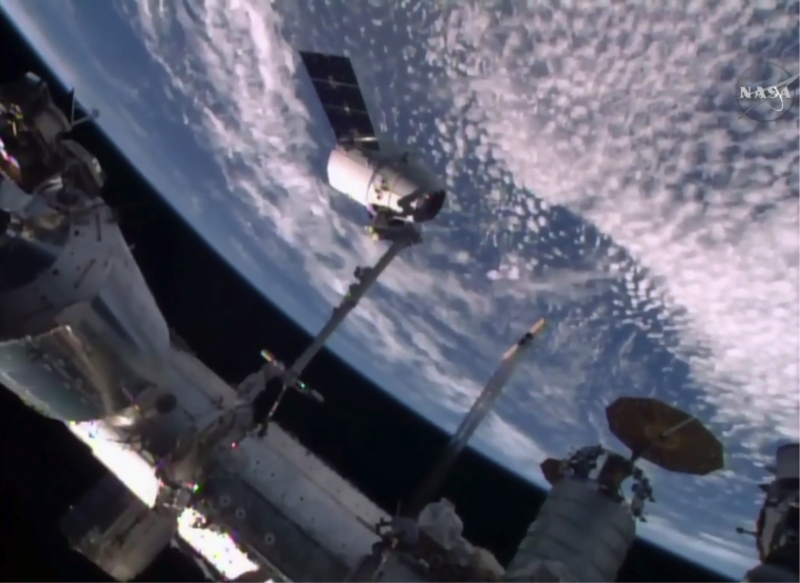 A couple hundred miles above us, the International Space Station orbited Earth with two spacecraft attached to it. What do these two things have in common? A quest for independence. The Fourth of July, of course, is the United States’ Independence Day, celebrating the anniversary of the 1776 signing of the Declaration of Independence, announcing that the former colonies were becoming a sovereign nation. The International Space Station is an early, but prominent step in NASA’s effort to achieve “Earth independence” in human deep-space exploration, a key part of our Journey to Mars. On the station, we are learning how to live off the Earth by conducting investigations to learn how the human body adapts to space and testing new technologies needed for longer missions. However, the two spacecraft docked to the space station demonstrate that our human spaceflight operations today are “Earth dependent.” While astronauts float freely in the microgravity aboard the station, they remain tethered to our planet by a supply chain of provisions needed to survive. Deliveries of food, science experiments, spare parts and gifts from home arrive and depart by spacecraft on a regularly scheduled basis. Earlier this year, the number of docked spacecraft reached six: American Dragon and Cygnus cargo ships, and Russian Progress cargo ships and Soyuz crew vehicles. Should something go wrong, the return to Earth is only a short distance away. American Dragon and Cygnus spacecraft can be seen here at the International Space Station, joining Russian Soyuz and Progress vehicles. In order to travel to Mars, astronauts will have to survive without that tether. When they depart Earth, they will sail into the void of space without the comfort of frequent visits from resupply ships. They will have no quick return; should something break or go wrong, Earth is potentially more than a year away. These pioneers will rely on themselves and what they have with them, or what has been sent ahead. They will be the first to be independent of our home planet, with both the freedom and responsibility that carries with it. Significant challenges await us as we move from Earth dependence into Earth independence, learning to operate in space in a way we never have before. To accomplish this, we will carry out “proving ground” missions – missions where we will, innovate, test, and validate new systems and capabilities that will help us learn to live longer and farther away from home. The first launch of the Space Launch System (SLS) rocket with the Orion crew vehicle will mark our entry into this proving ground era, relying on new systems farther from Earth than any human spaceflight mission has ever ventured. SLS and Orion will allow us to launch habitats and other equipment that will support the first astronauts to not only visit, but to live in deep space around and beyond our moon. Astronauts in deep space will need to be able to survive without frequent resupply missions from Earth or being able to return quickly to Earth. When we have demonstrated the ability to live and thrive in deep space, the time will come for the first mission to leave the neighborhood of the Earth and moon and extend human existence into the solar system, a mission that will not only be a major step toward human landings on Mars but will be our declaration of Earth-independence. In that moment, the word “Independence” will designate the time when humankind became an interplanetary species. Get the grills and fireworks ready, because that will be an occasion to celebrate. Over the next year, the rocket comes to the Rocket City in a big way. Huntsville, Alabama, a.k.a. “Rocket City,” is home to NASA’s Marshall Space Flight Center, where today the Space Launch System (SLS), the powerful rocket NASA will use for human exploration of deep space, is being developed. More than six decades ago – before NASA even existed – Huntsville laid claim to the nickname thanks to its work on missiles and rockets like the Juno that launched the first American satellite or the Redstone used for the first Mercury launches. In the years since, Huntsville, and Marshall, have built on that legacy with work on the Saturn V rockets that sent astronauts to the moon, the space shuttle’s propulsion systems, and now with SLS. A steel beam is “flown” by crane into position on the 221-foot-tall (67.4 meters) twin towers of Test Stand 4693 during “topping out” ceremonies April 12 at NASA’s Marshall Space Flight Center in Huntsville, Alabama. While the program is managed at Marshall Space Flight Center, contractors around the country are building the rocket. Engines are being tested in Mississippi. The core stage is being built in Louisiana. Booster work and testing is taking place in Utah. Aerospace industry leaders and more than 800 small businesses in 43 states around the country are providing components. The Marshall team has also been involved with the hardware, largely through testing of small-scale models or smaller components. The center also produced the first new piece of SLS hardware to fly into space – a stage adapter that connected the Orion crew vehicle to its Delta rocket for Exploration Flight Test-1 in 2014 (See Orion’s First Flight for more.) The same adapter will connect Orion to SLS for their first flight in 2018. Workers prepare the top half of a test version of the SLS Launch Vehicle Stage Adapter. The completed adapter will undergo structural testing at Marshall later this year. Now, however, big things are happening in the Rocket City. The new Orion stage adapter for the upcoming launch is being built. The larger Launch Vehicle Stage Adapter, which will connect the core and second stages of the rocket, is being built at Marshall by contractor Teledyne Brown Engineering. 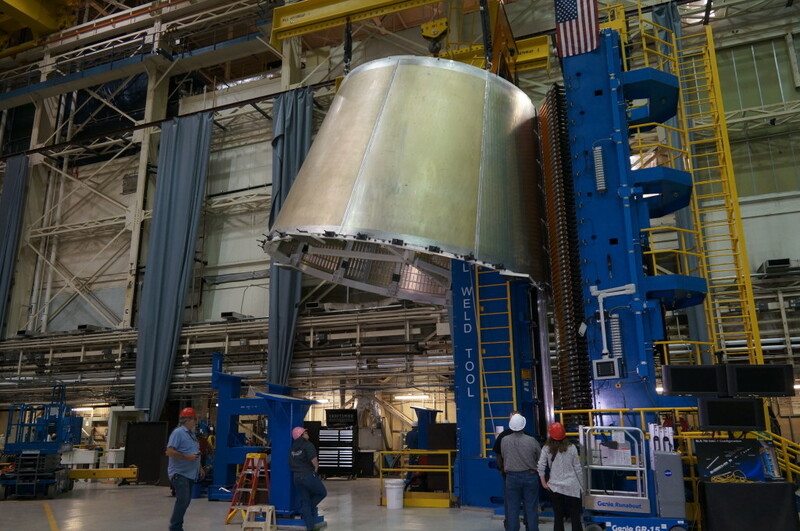 This year, test versions of those adapters and the Interim Cryogenic Propulsion Stage (ICPS) will be assembled into a 56-foot-tall stack, which will be placed in a test stand to see how they handle the stresses of launch. Those test articles built locally will be joined by larger ones produced at the Michoud Assembly Facility outside New Orleans. Test versions of the rocket’s engine section, oxygen tank and hydrogen tank will be shipped by barge from Michoud to Marshall. 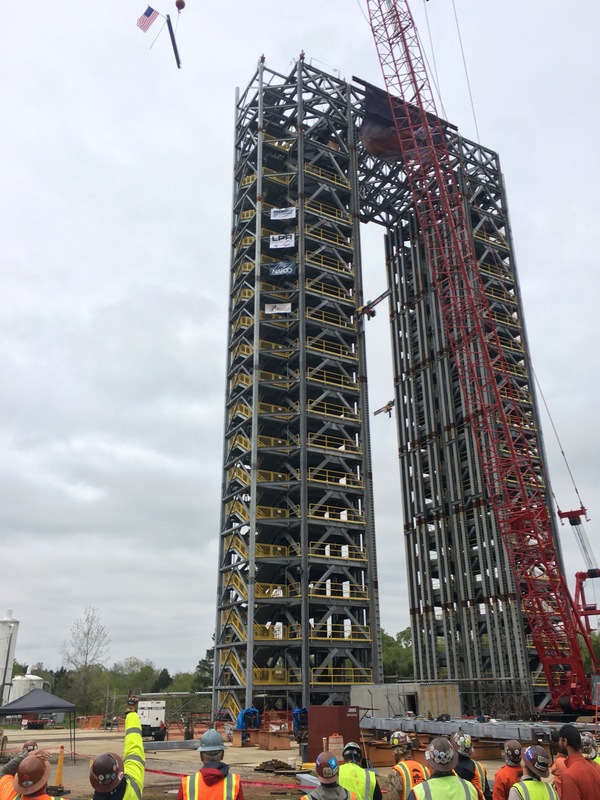 Two new test stands – one topped out last month at 221 feet tall – have been built at Marshall, joining historic test stands used to test the Saturn moon rockets. In addition to rocket development, Marshall is involved in numerous other efforts, including supporting all U.S. scientific research conducted aboard the International Space Station. Fifty-five years ago this month, Alan Shepard became the first American in space riding on a Redstone rocket, named for the Huntsville army base where his rocket had been designed – Redstone Arsenal. Today, Marshall, located on the same red clay that gave the arsenal and rocket their name, is undertaking perhaps its largest challenge yet – building a rocket to carry humans to the red stone of Mars. Huntsville grew substantially from its small Southern town roots during its early days of rocket work in the 1950s and ‘60s, and Marshall has gone on to be involved in projects such as Skylab, Spacelab, the Hubble Space Telescope and the International Space Station, to name a few. But despite branching out its work both in space and other technology areas, Huntsville remains the Rocket City. …After all, we built this city on a rocket role. Earlier this month, another successful test firing of a Space Launch System (SLS) RS-25 engine was conducted at Stennis Space Center in Mississippi. Engine testing is a vital part of making sure SLS is ready for its first flight. 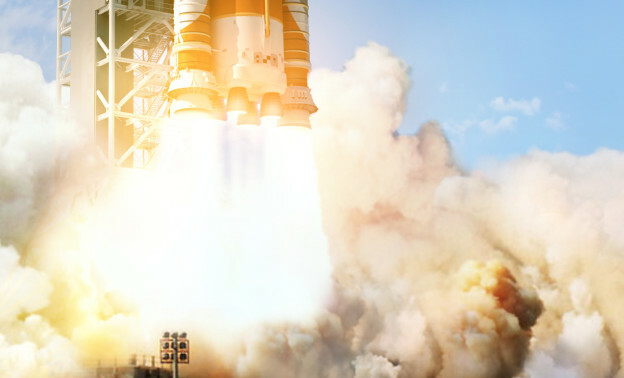 How do the engines handle the higher thrust level they’ll need to produce for an SLS launch? Is the new engine controller computer ready for the task of a dynamic SLS launch? What happens when if you increase the pressure of the propellant flowing into the engine? 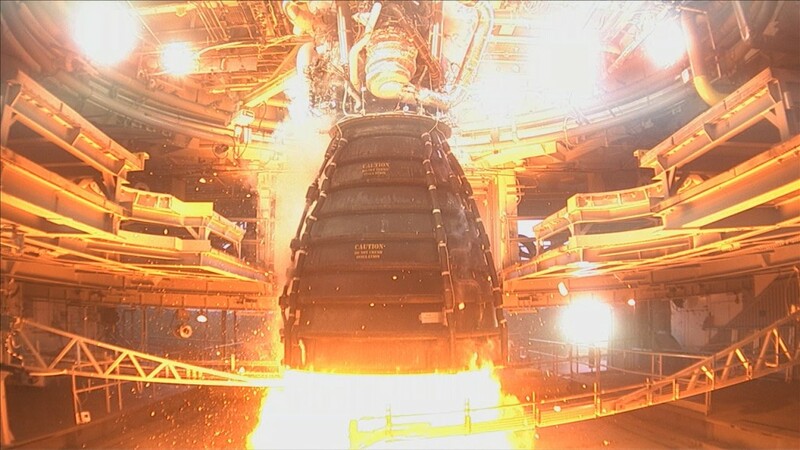 SLS will produce more thrust at launch than any rocket NASA’s ever flown, and the power and stresses involved put a lot of demands on the engines. Testing gives us confidence that the upgrades we’re making to the engines have prepared them to meet those demands. If you read about the test – and you are following us on Twitter, right? – you probably heard that the engine being used in this test was the first “flight” engine, both in the sense that it is an engine that has flown before, and is an engine that is already scheduled for flight on SLS. You may not have known that within the SLS program, each of the RS-25 engines for our first four flights is a distinct individual, with its own designation and history. Here are five other things you may not have known about the engine NASA and RS-25 prime contractor Aerojet Rocketdyne tested this month, engine 2059. 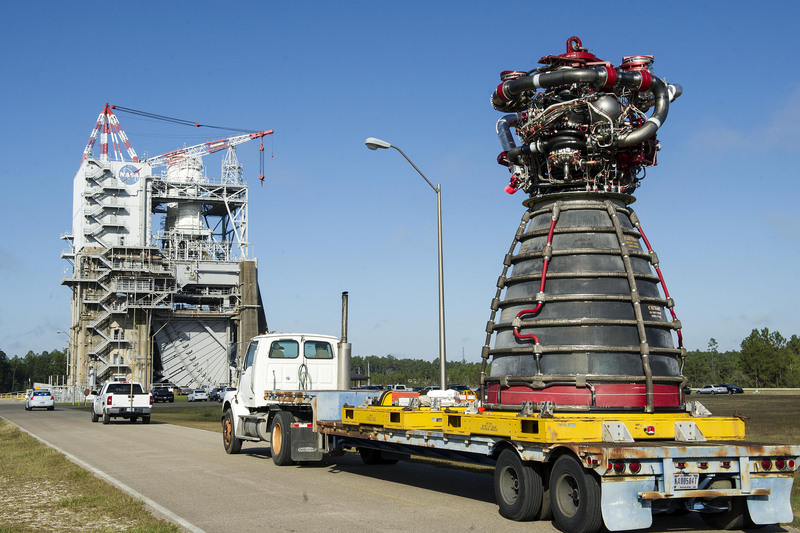 Engine 2059 roars to life during testing at Stennis Space Center. 1. Engine 2059 Is a “Hubble Hugger” – In 2009, the space shuttle made its final servicing mission to the Hubble Space Telescope, STS-125. Spaceflight fans excited by the mission called themselves “Hubble Huggers,” including STS-125 crew member John Grunsfeld, today the head of NASA’s Science Mission Directorate. Along with two other engines, 2059 powered space shuttle Atlantis into orbit for the successful Hubble servicing mission. In addition to its Hubble flight, engine 2059 also made four visits to the International Space Station, including the STS-130 mission that delivered the cupola from which station crew members can observe Earth below them. 2. The Last Shall Be First, and the Second-to-Last Shall Be Second-To-First – The first flight of SLS will include an engine that flew on STS-135, the final flight of the space shuttle, in 2011. So if the first flight of SLS includes an engine that flew on the last flight of shuttle, it only makes sense that on the second flight of SLS, there will be an engine that flew on the second-to-last flight of shuttle, right? Engine 2059 last flew on STS-134, the penultimate shuttle flight, in May 2011, and will next fly on SLS Exploration Mission-2. 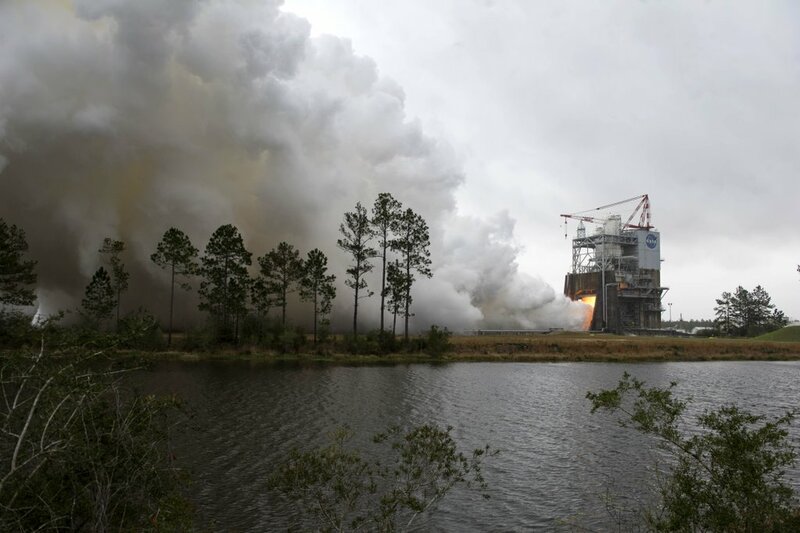 The test of engine 2059 at Stennis Space Center on March 10. 3. Engine 2059 Is Reaching for New Heights – As an engine that flew on a Hubble servicing mission, engine 2059 has already been higher than the average flight of an RS-25. Hubble orbits Earth at an altitude of about 350 miles, more than 100 miles higher than the average orbit of the International Space Station. But on its next flight, 2059 will fly almost three times higher than that – the EM-2 core stage and engines will reach a peak altitude of almost 1,000 miles! Click to see larger version. 4. Sometimes the Engine Tests the Test Stand – The test of engine 2059 gave the SLS program valuable information about the engine, but it also provided unique information about the test stand. Because 2059 is a flown engine, we have data about its past testing performance. Prior to the first SLS RS-25 engine test series last year, the A1 test stand at Stennis had gone through modifications. Comparing the data from 2059’s previous testing with the test this month provides calibration data for the test stand. 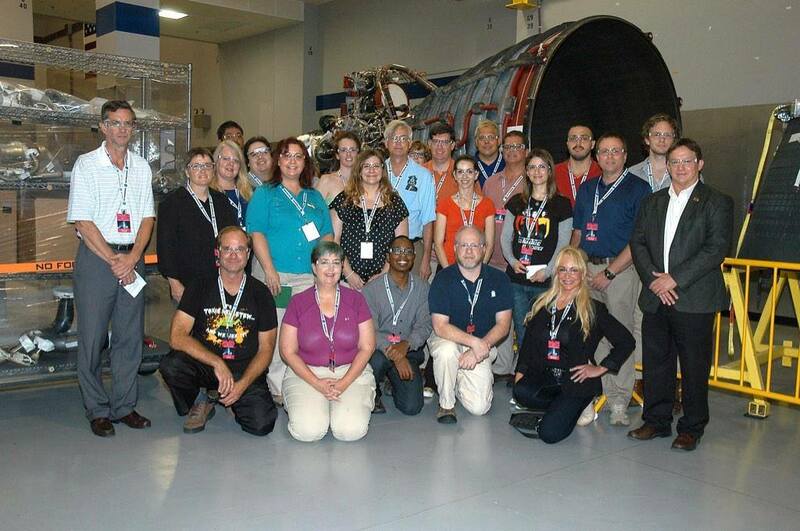 Attendees of a NASA Social visiting Stennis Space Center being photobombed by engine 2059. 5. You – Yes, You – Can Meet Awesome SLS Hardware Like Engine 2059 – In 2014, participants in a NASA Social at Stennis Space Center and Michoud Assembly Facility, outside of New Orleans, got to tour the engine facility at Stennis, and had the opportunity to have their picture made with one of the engines – none other than 2059. NASA Social participants have seen other SLS hardware, toured the booster fabrication facility at Kennedy Space Center in Florida, and watched an RS-25 engine test at Stennis and a solid rocket booster test at Orbital ATK in Utah. Watch for your next opportunity to be part of a NASA Social here. If you do not see the video above, please make sure the URL at the top of the page reads http, not https. Next Time: We’ve Got Chemistry! This week’s Rocketology post is by the newest member of the SLS communications team, Beverly Perry. 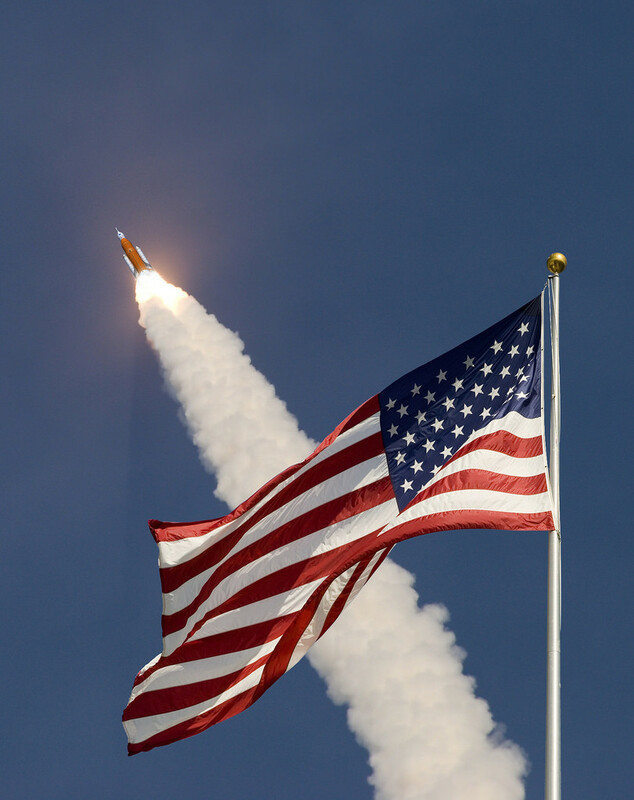 When NASA’s Space Launch System (SLS) first flies, it will slice through Earth’s atmosphere, unshackling itself from gravity, and soar toward the heavens in an amazing display of shock and awe. 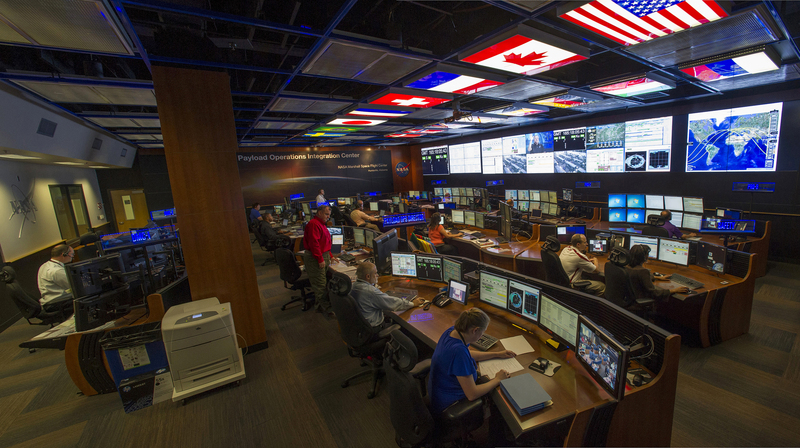 To meet the engineering challenges such an incredible endeavor presents, NASA’s Marshall Space Flight Center draws upon a vast and diverse array of engineering talent, expertise and enthusiasm that spans multiple disciplines and, in some cases, a generation. Or two. Kathryn Crowe is a twenty-something aerospace engineer who tweets from her smartphone and calls herself a “purveyor of the future.” Hugh Brady, on the other hand, began his career at Marshall during the days of punch cards and gargantuan room-sized IBM mainframes with an entire 16 kilobytes (!) of memory. 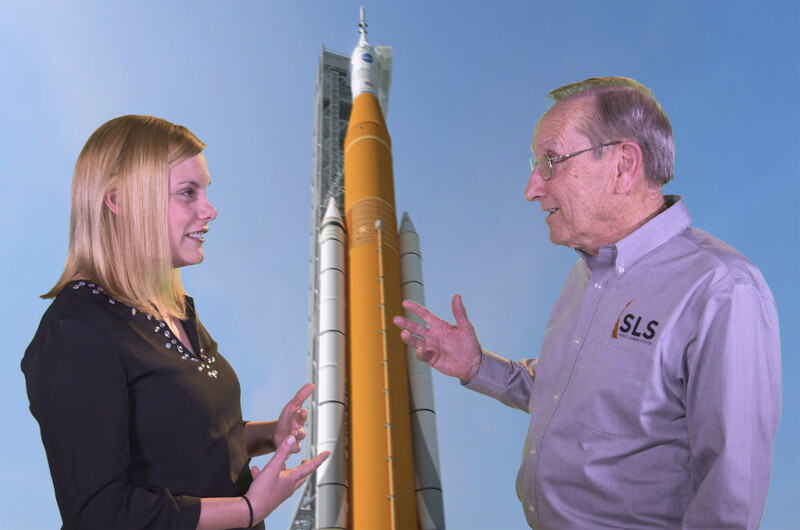 While they’ve had very different experiences, Kathryn Crowe and Hugh Brady share a common excitement for their work on SLS. But if you think these two don’t have much common ground on which to build a strong working foundation, well, think again. Although the two aerospace engineers may be separated by a couple generations, they speak of each other with mutual admiration, respect and enthusiasm. And like any relationship built on a solid foundation, there’s room for fun, too. 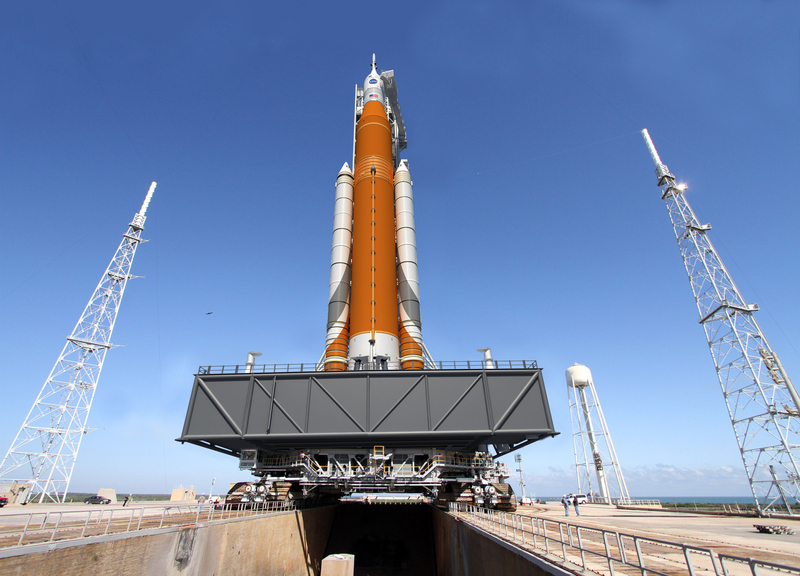 Crowe and Brady have worked together evaluating design options and deciding on solutions to make the second configuration of SLS as flexible and adaptable as possible. 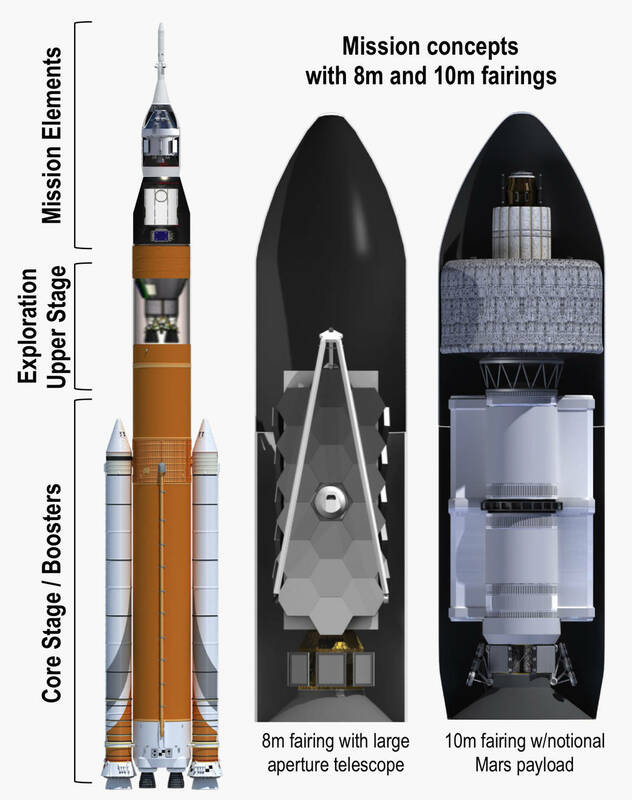 This upgraded configuration – known as Block 1B – adds a more-powerful upper stage and will stand taller than the Saturn V. It could fly as early as the second launch of SLS, which will be the first crewed mission to venture into lunar orbit since Apollo. Block 1B also presents the opportunity to fly a co-manifested payload, or additional large payload in addition to the Orion crew capsule. The addition of an Exploration Upper Stage to SLS will make the rocket more powerful and open up new mission possibilities. For Brady, “Things have a tendency to repeat.” While technology and solutions continue to improve, some of the challenges of spaceflight will always remain the same. When it comes to wrestling with the challenges of a co-manifested payload, Brady draws on his experience, but focuses on solutions that are tailored for SLS. It’s bringing lessons from the past into the present in order to find the best solution for future missions. “It’s drawing on what we’ve learned from the past but not necessarily repeating the past. We want the best solution for this vehicle,” he emphasizes. Crowe says the experience and knowledge Brady brought to the table made all the difference when studying options for the SLS vehicle. “Hugh would say, ‘I think we worked on this particular technical problem when we were initially flying.’ He could draw parallels so we didn’t reinvent the wheel,” Crowe says. Since then, Brady has become something of a mentor to Crowe and other younger team members. “I think that having that kind of precedent to build upon it really is a beautiful thing,” Crowe says. For his part, Brady says he feels a “comfort” level in passing the United States’ launch vehicle capabilities on to the next generation of engineers and other supporting personnel. “One of the things I find very exciting is to look around and see the young talent around the center with their energy and enthusiasm. I feel good thinking about when I do hang it up – again – that they will carry on and even do more than we did,” he says. https://www.youtube.com/watch?v=https://www.youtube.com/watch?v=gXMhOe1pRKc[/embedyt]If you do not see the video above, please make sure the URL at the top of the page reads http, not https. On one end of the technology spectrum, you have rocket science, mastering the laws of physics to allow human beings to break the chains of gravity and sail through the void of space. On the other end, you have the earliest humans, first learning to use the world around them in innovative ways to do things they previously couldn’t. What do these two extremes have in common? Making fire. Just like the secret to learning to cook food was mastering the creation of flames, creating fire is also the secret to leaving the planet. We just use a much bigger fire. 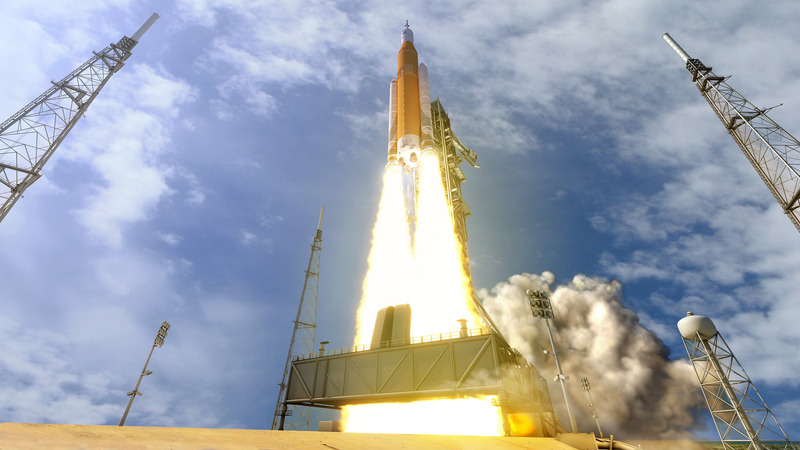 Solid rocket motors and liquid-fuel engines will work together to propel the first SLS into space. If you’ve watched the first video in our No Small Steps series you’ve learned why going to Mars is a very big challenge, and why meeting that challenge requires a very big rocket. In the second installment we talked about how NASA’s Space Launch System (SLS) builds on the foundation of the Saturn V and the space shuttle, and then uses that foundation to create a rocket that will accomplish things neither of them could. Now, the third No Small Steps video takes a step further by looking at the basics of the monumental energy that makes the rocket go up. If you’ve been following this Rocketology blog and the No Small Steps videos, you’re aware that the initial configuration of SLS uses two different means of powering itself during launch – solid rocket boosters and liquid-fuel engines. But why? What’s the difference between the two, and what role does each play during launch? Well, we’re glad you asked, because those are exactly the questions we answer in our latest video. With more SLS engine and booster tests coming in the next few months, this video is a great way to get “fired up” about our next steps toward launch. During his yearlong mission aboard the International Space Station, Scott Kelly traveled over 143 million miles in orbit around Earth. On average, Mars is 140 million miles away from our planet. There’s nothing average about a trip to Mars; so of course you don’t travel an “average distance” to get there. Launches for robotic missions – the satellites and rovers studying Mars today – are timed around when Earth and Mars are about a third of that distance, which happens every 26 months. While the shortest distance between two points is a straight line, straight lines are hard to do in interplanetary travel. 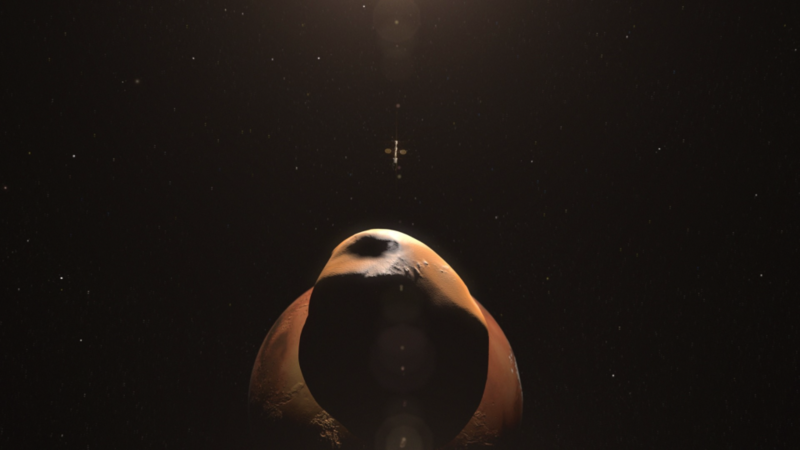 Instead, Mars missions use momentum from Earth to arc outward from one planet to the other. 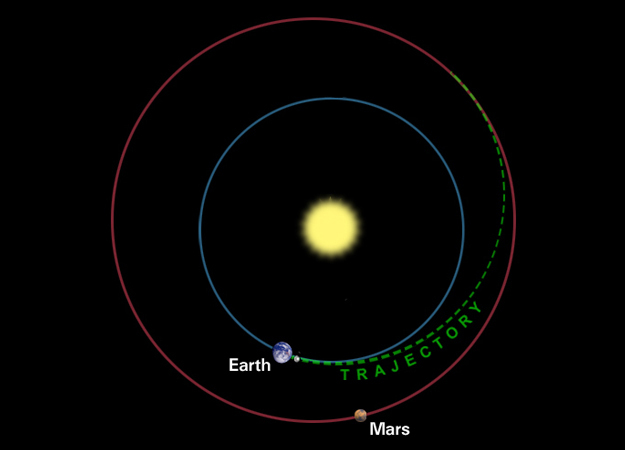 The Opportunity rover launched when Earth and Mars were the closest they’d been in 60,000 years, and the rover still had to travel 283 million miles to reach the Red Planet. 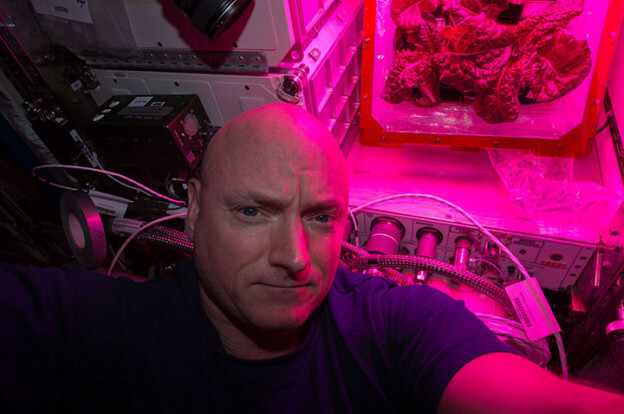 On the International Space Station, Scott Kelly was traveling at more than 17,000 miles per hour, an ideal speed for orbital research that keeps the station steadily circling Earth every 90 minutes. To break free of orbit and go farther to deep space, spacecraft have to travel at higher speeds. Opportunity, for example, traveled at an average of 60,000 miles per hour on the way to Mars, covering twice the distance Kelly traveled on the station in just over half the time. Although Earth and Mars were relatively close together when Opportunity launched, the rover’s trip out was twice the average distance between the two planets. The fastest any human being has ever traveled was the crew of Apollo 10, who hit a top speed of almost 25,000 miles per hour returning to Earth in 1969. For astronauts to reach Mars, we need to be able to propel them not only faster than the space station travels, but faster than we’ve ever gone before. But the real lesson of Kelly’s year in space isn’t the miles, it’s the months. The human body changes in the absence of the effects of gravity. The time Kelly spent in space will reveal a wealth of new data about these changes, ranging from things like how fluid shifts in microgravity affected his vision to the behavioral health impacts of his long duration in the void of space. This information reveals more about what will happen to astronauts traveling to Mars and back, but it also gives us insight into how to equip them for that trip, which will be approximately 30 months in duration round-trip. What sort of equipment will they need to keep them healthy? What accommodations will they require to stay mentally acute? What sort of vehicle do we need to build and equip to send them on their journey? Months and millions of miles. Momentum and mass. These are some of the most basic challenges of Mars. We will need to build a good ship for our explorers. And we will need the means to lift it from Earth and send it on its way fast enough to reach Mars. 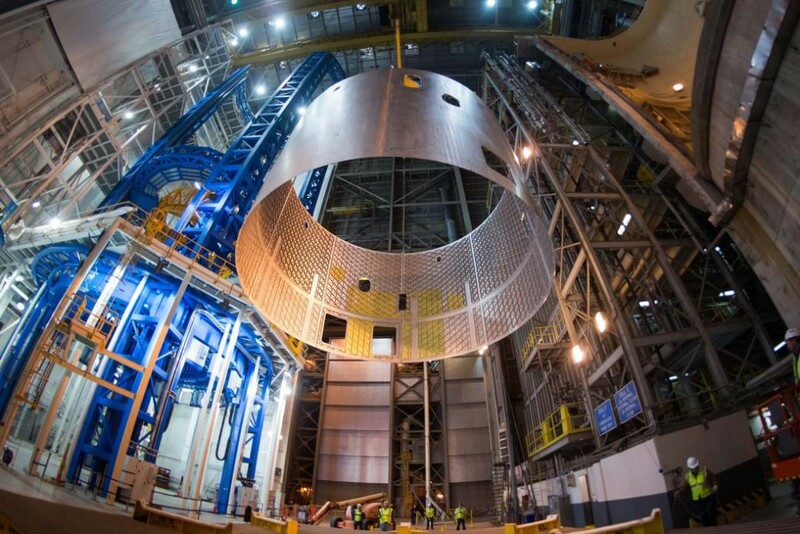 An engine section weld confidence article for the SLS Core Stage is taken off the Vertical Assembly Center at NASA’s Michoud Assembly Facility in New Orleans. While Scott Kelly has been living in space helping us to learn more about the challenges, we’ve been working on the rocket that will be a foundational part of addressing them. Scott Kelly left Earth last year half a month after the Space Launch System (SLS) Program conducted a first qualification test of one of its solid rocket boosters. Since then, we have conducted tests of the core stage engines. We’ve started welding together fuel tanks for the core stage. We’ve begun assembling the upper stage for the first flight. We’ve been building new test stands, and upgraded a barge to transport rocket hardware. The Orion program has completed the pressure vessel for a spacecraft that will travel around the moon and back. Kennedy Space Center has been upgrading the facilities that will launch SLS and Orion in less than three years. And that’s just a part of the work that NASA’s done while Kelly was aboard the space station. Our robotic vanguard at Mars discovered evidence of flowing liquid water, and we’ve been testing new technologies to prepare us for the journey. Down here and up there, it’s been a busy year, and one that has, in so many ways, brought us a year closer to Mars. The #YearInSpace months and millions of miles may be done, but many more Mars milestones are yet to come! You know how big the SLS vehicle will be. 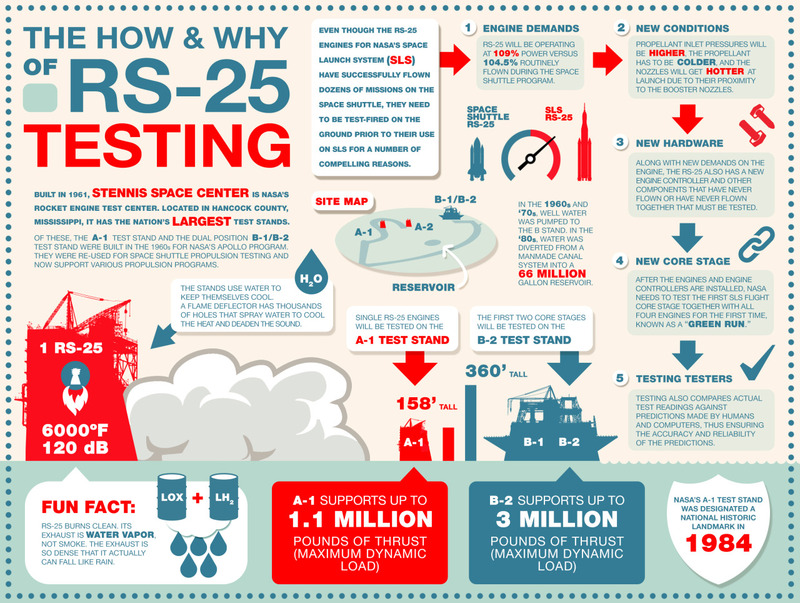 We described the tremendous power and thrust of just one of the RS-25 engines after last year’s test firings. You may have witnessed live as we fired one of the massive five-segment solid rocket boosters last March. Through all that, perhaps you can imagine how incredible it will be at launch when all four engines and both boosters ignite together to lift this 322 feet tall, 5.75 million pound rocket up through the atmosphere and toward deep space. Imagine the thunderous vibration in your chest even as you stand several miles away. Note: Actually watching an SLS launch from this close is strongly not advised (or permitted). Orion hardware is being tested to withstand sound levels that would turn a person to liquid. We’ve talked about how it will feel to be there when the rocket launches. Now, let’s talk about how it would feel to BE the rocket, launching. Envision the power generated at launch as the engines and boosters throttle up to 8.8 million pounds of thrust. The heat is incredible! The vehicle starts to shake. The engine nozzles, as big and solid as they seem, will warp under the pressure of heat when the engines ignite seconds ahead of the boosters. While still on the pad, the boosters are bearing the weight of the entire vehicle even as they fire up for launch – the weight of almost 13 Statues of Liberty resting on an area smaller than an average living room. Then, you – the rocket – are released to fly, and up you go. More than 5 million pounds of the weight of the rocket pushing down are now counteracted by more than 8 million pounds of thrust pushing from the opposite direction. Remember those 13 Statues of Liberty? Now the bottom of the rocket is feeling the pressure of 29 of them instead! And now things are heating up on the front end of the rocket as well. Approaching Mach 1, shock waves move over the entire vehicle. Friction from just moving through the air causes the nose of the vehicle to heat. The shock waves coming off the booster nose cones strike the core stage intertank and can raise the temperature to 700 degrees. The foam insulation not only keeps the cryogenic tanks cold, it keeps the heat of ascent from getting into the intertank structure between the hydrogen and oxygen tanks. 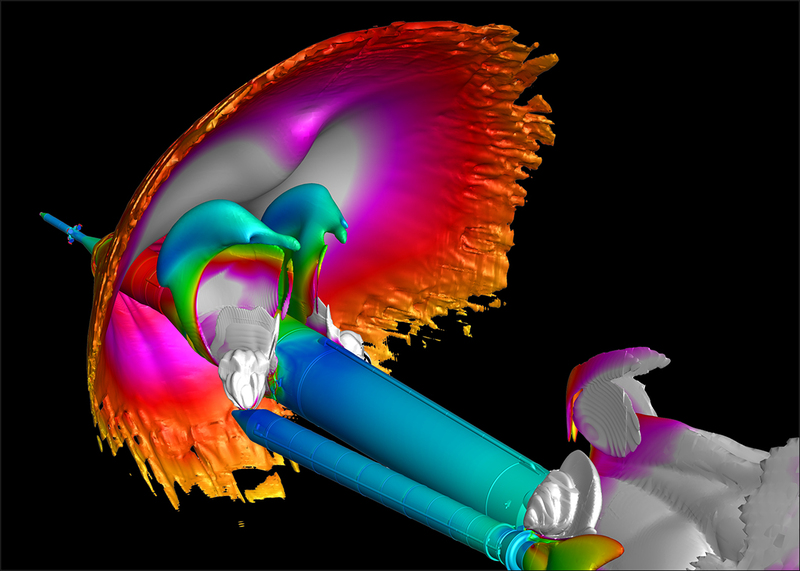 Computer model of a shock wave at the front of the SLS vehicle at the time of booster separation during launch. Are you feeling it yet? That’s a lot to handle. These impacts from weight (mass), pressure, temperature and vibration are called “loads.” It’s a key part of the “rocket science” involved in the development of the SLS vehicle. A load is a pressure acting on an area. Sounds simple, right? There are all kinds of loads acting on SLS, some even before it leaves the launch pad. Tension and compression (pulling and pushing), torque (twisting), thermal (hot and cold), acoustic (vibration), to name a few. There are static (stationary) loads acting on the big pieces of the rocket due to gravity and their own weight. There are loads that have to be considered when hardware is tipped, tilted, rolled, and lifted at the factory. 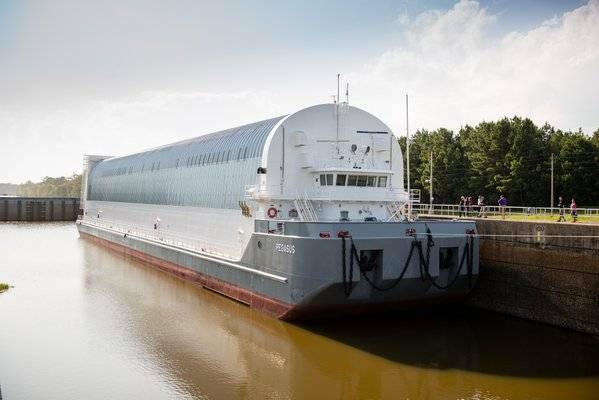 There are “sea loads” that act on the hardware when they ride on the barge up and down the rivers to various test sites and eventually across the Gulf of Mexico and up the Florida coast to Kennedy Space Center for launch. Engineers have to consider every single load, understanding how they will affect the structural integrity of the rocket and how they will couple and act together. You’ve probably never thought of “riding on a boat” as rocket science, but SLS has to be designed to handle sea loads as well as space loads. When SLS is stacked on the mobile launcher at KSC, there are loads acting through the four struts securing the core stage to the boosters and down into the booster aft skirts that have to carry the entire weight of the launch vehicle on the mobile launcher. Then there are roll-out loads when the mobile launcher and crawler take SLS more than 4 miles from the Vehicle Assembly Building to the launch pad. There are many more loads as the vehicle is readied for launch. How do engineers know the rocket’s ready to handle the loads it has to face to send astronauts into deep space? Step One is good design – developing a rocket robust enough to withstand the strains of launch. However this is difficult as the vehicle needs to be as lightweight as possible. Step Two is digital modeling – before you start building, you run many, many simulations in the computer to a level of detail that would make any Kerbal Space Program fan jealous. Step Three is to do the real thing, but smaller – wind-tunnel models and even scale-model rockets with working propulsion systems provide real-life data. And then comes Step Four – build real hardware, and stress it out. Test articles for the core stage and upper stage elements of the vehicle will be placed in test stands beginning this year and subjected to loads that will mimic the launch experience. Engines and boosters are test-fired to make sure they’re ready to go. Still want to be the rocket? Stay tuned for more on loads as we do everything possible to shake, rattle, and yes, even roll, the pieces of the rocket, ensuring it’s ready to launch in 2018. What’s A Spacecraft Factory Like? Think Big! Last month, welding concluded on the pressure vessel, the basic structure of the Orion deep-space crew vehicle. Workers from around the country who had prepared components and materials for the spacecraft were invited to NASA’s Michoud Assembly Facility outside New Orleans to see the culmination of their labor before it was transported to Kennedy Space Center in Florida for completion. 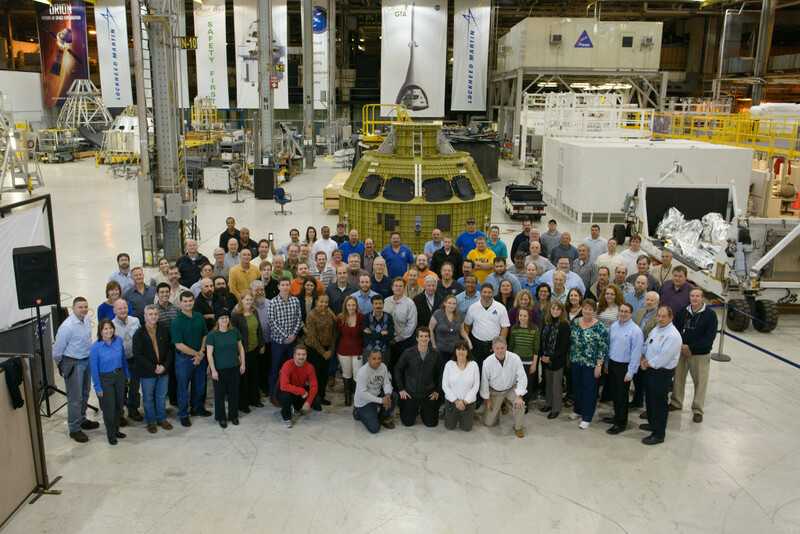 The Orion team at the Michoud Assembly Facility poses with the Exploration Mission 1 crew module pressure vessel prior to its transfer to the Kennedy Space Center ,where it will undergo final assembly in preparation for flight in 2018. Even to those who helped build it, and even in that unfinished state, Orion was an impressive sight. Workers found themselves standing feet away from the core of a spacecraft that will travel around the moon, farther into space than Apollo ever went, and then return to Earth; hardware that they had helped create. And even though they had seen components of it, some expressed surprise at the size of what they’d helped build. From a big crew vehicle to a big rocket to “the world’s largest dishwasher” (What’s that? Keep reading) “big” was the word of the day when the team at Michoud marked the completion of welding of the pressure vessel for the first Orion capsule to fly on a Space Launch System (SLS) rocket. It was … well, a big deal. Which is appropriate, because Michoud Assembly Facility is a big place. Originally built in 1940 to produce plywood airplanes for World War II, Michoud is one of the largest manufacturing plants in the world, with the main facility covering 43 acres under one roof. Michoud became a NASA facility in 1961. Among its contributions, Michoud produced stages for Saturn V rockets, and the external tanks that fueled every space shuttle flight. The Orion pressure vessel has now arrived at Kennedy Space Center, where it will be outfitted for its next mission, going beyond the moon. How big is Michoud? The factory is so large that if you don’t know what you’re looking for, you could walk through and totally miss the largest spacecraft welding tool in the world – not because it’s easily missed, but because it’s set apart from the main floor in its own separate chamber, behind one of many bay doors and a couple of mundane-looking doorways. Enter the chamber, however, and there is nothing mundane about the 170-foot-tall Vertical Assembly Center, a new tool built custom for SLS. Into the VAC are placed 27.6-foot diameter barrels, domes and rings, and it welds them together into giant fuel tanks for the SLS core stage. Then they go in the “largest dishwasher,” as SLS core stage manager Steve Doering referred to it at the event, a piece of equipment on the other side of the chamber that washes them post-welding. Core stage barrel sections are now being welded together to form fuel tank test articles in the Vertical Assembly Center at Michoud. On the day of the event, visitors to the chamber of the Vertical Assembly Center were greeted by its first product – a stack of two barrels, about 40 feet high, which filled the entrance to the VAC chamber. By itself, the stack looms over visitors as they approach it, but it invites a quick mental calculation: The core stage of SLS will be five times taller still than that. And that’s still less than two-thirds the height of the entire rocket. It’s big. 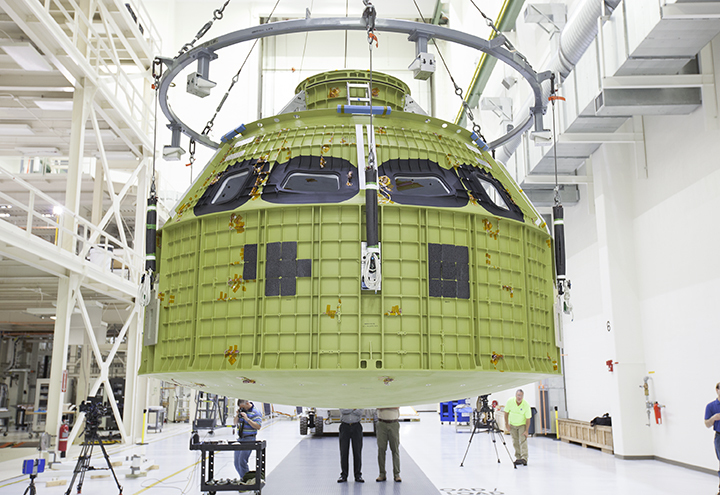 Orion then traveled to Kennedy Space Center to be outfitted as a cutting-edge spacecraft. At the same time, the SLS fuel tanks are in production at MAF and will undergo testing before a complete SLS core stage is test fired and shipped to Kennedy as well. There, the core stage and the SLS boosters and upper stage will join Orion for stacking and then launch. And that will be one really big day.